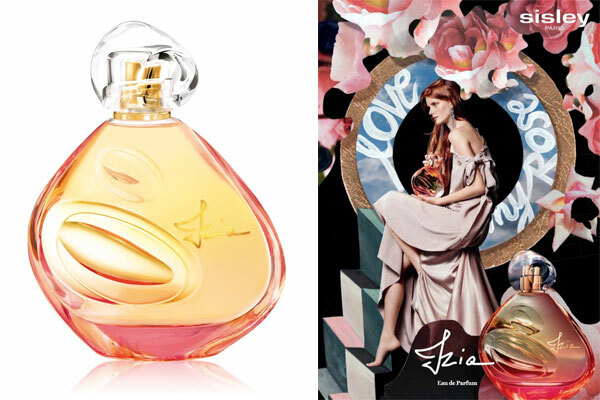 Izia by Sisley - A floral fragrance for women. This feminine bouquet created by perfumer Amandine Clerc-Marie, featuring the scent of roses with a radiant floral heart and warm woody base, includes notes of bergamot, pepper, aldehydes, rose, transparent florals, angelica, cedar, amber, and musk. The Sisley perfume bottle features a beautiful rose-yellow hew with gold accents. Named after founder Isabelle d'Ornano (Izia is the Polish diminutive of Isabelle) and the handwritten letters signed by Isabelle, this fragrance is structured around her favorite flower, the rose. The sensual perfume was launched in February 2017 and is available in an eau de parfum spray. The fragrance campaign features Isabelle d'Ornano's niece, Sonia d'Ornano. Package Design Rose and yellow hued feminine bottle with gold accents. Find Your Perfect Scent - Discover new favorites and soon-to-be classics that accentuate your personal style. Fresh & Modern - This group of scents shares the sparkling citruses often found in men's colognes, but also contain herbaceous notes. They're the ideal type of perfume for women who don't necessarily want something ladylike.